OzProofreader(OzPr): Australian proofreaders will assist you ! You write for you, but we will improve the words you write to make them accurate and better ! Why do you need your work to be proofread ? While writing, you may have a blindside. If you are not careful, you might understand it but your readers do not. While writing, you sometimes know what you want to write, but you don't know the accurate word you should use and write. Writing a good article in English, it would be great to have a native English speaker to proofread your work. It would be very useful. Finding the right words, it may convince the reader to continue reading the article with interest. You may need a proofreader to advise you. Producing good publication material, is all about reliability, quality, impression and credibility. Your proofreader will assist you in this regard. You should not rely on yourself as a proofreader. Hiring a proofreader is a good option. Sometimes the grammatical errors could make you look dumb. Click here. A proofreader helps you avoid common grammatical mistakes like here. What do we fix when proofreading your document? How to send your document? Send your document for a quick quotation (QQ) to ozproofreader@gmail.com . Kindly state your proposed deadline or due date (DD). After receiving the QQ, you have to decide whether you want to proceed or not. If you would like to proceed, please send an email to ozproofreader@gmail.com in order to confirm it. In some cases, you will need to pay a deposit via bank transfer/cash/etc. You will receive the "edited" document from the proofreader. Within 24 hours you will need to confirm your satisfaction level and will be asked to make a full payment. Kindly note that, the fee for proofreading or copy editing your work will depend on the length of the document and the quality of the written English. How to make a payment to us? We can only accept two payment methods. We will advise you via email on this matter. Helen is a proofreader holding a Master of Arts (Literature) from the University of Queensland and undergraduate degrees in Law (QUT) and Arts (UQ). Since working as a Language and Learning Adviser at Queensland University of Technology, she has developed expertise in editing academic works in a range of disciplines. Sherryn has had extensive experience in proofreading large, complicated documents for major law firms in Australia. Accuracy and attention to detail in consistency of English grammar usage was crucial, in addition to operating to tight deadlines. She has also had experience in proofreading material for a marketing firm in Tokyo, Japan where she lived for two years. Sherryn has an enormous interest in Asian countries and studies Japanese, Indonesian and Arabic. She lives in Brisbane with her husband. The OzProofreader.com is a group of freelance Australian proofreaders. 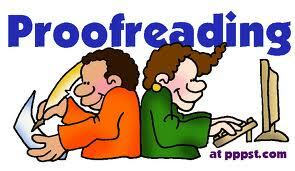 Our aim is to provide proofreading services around the world at very reasonable price.